Pilots receive the same meals as passengers, and some airlines to require pilots and co-pilots to eat different meals as a safety precaution. Ask the Captain: Do pilots have to eat different meals on a flight? Do pilots have to eat different meals on a flight? Question: Can the 747 be saved? It's sad to see the most beautiful and iconic passenger plane ever built being retired. Answer: The 747 will remain in service in cargo operations for several more years. In passenger service, it has been overtaken economically. The new fuel-efficient twins cost so much less to operate that the 747 cannot compete. Four-engine airplanes are becoming more rare due to economics and the technical advances of the twins. This trend will continue. Question: If a tire blows out on the runway, what is the normal course of action? Answer: Most modern airliners have more than a single tire on a landing gear. The tires are designed to take the load if the companion tire is compromised. If the pilots know a tire has failed during takeoff at low speed, they will abort the takeoff. At high speed they will go ahead and take off, then return to land for a safety inspection. If the tire fails during landing, a normal landing is conducted. Question: Are airplanes more likely to experience more turbulence during one season than another? Answer: Each season has challenges: Summer has thunderstorms and tropical storms. Autumn has late tropical storms (usually the quietest season). Winter has higher winds, blizzards and more clear air turbulence. Spring has fast-moving fronts and high winds, causing severe squall lines. Each of these events can cause turbulence. It depends on the vagaries of the year’s weather which season is worse or has more frequent turbulence. Question: What do you miss most about being an airline pilot? Answer: I miss the camaraderie of many of my fellow pilots; the challenge of precisely maneuvering an airplane, particularly a jet, from place to place in inclement weather safely; the beauty of sights that only pilots get to see (e.g. St. Elmo’s fire, lines of thunderstorms at night with lightning illuminating them and sunrises over mountains and oceans from cruise altitude). Question: Why are some runways not perfectly flat, and does this pose any problems during landings and takeoffs? Answer: Some runways are more challenging due to the slope and humps. The slope is included in performance calculations for takeoff and landing, as it can affect acceleration and deceleration. Humps can cause “firm” landings if the pilots are not aware of them or if they miscalculate the touchdown point. Runways are rarely the same elevation at each end, so in many cases the question is the amount of slope. There is also a need to keep taxiways at a reasonable slope, and there may be differences in elevation on a different axis. Airport designers must make compromises for efficiency and cost. Question: Can pilots change their route for a better view of an eclipse? Answer: A captain always has the final decision regarding the route of flight and how the airplane is being flown. Air traffic control is responsible for ensuring proper separation between airplanes on instrument flight plans. Usually pilots will follow their filed flight plan routing (with ATC approval); if it coincides with the eclipse then making a PA to advise the passengers would be routine. Business aviation or private pilots may request special routing to view the eclipse from cruising altitude and if ATC can accommodate the request they will. Question: Why haven't modern airplanes been built with extensive video surveillance of the outside of the aircraft so pilots can observe all parts, especially if something goes wrong? Answer: Some large airplanes have cameras installed in strategic places. They provide valuable information for taxiing and can be used in flight if necessary. The instruments provide pilots with a good indication of problems or system malfunctions. The direct answer to your question is that the manufacturers have not determined that the benefit justifies the cost. Question: How and why is fuel dumped from a flight: Answer: Some airplanes, usually large intercontinental jets, have the capability to dump fuel in flight. This is done via valves in the wingtips that allow fuel to be pumped out and vaporized. The purpose of dumping fuel is to reduce the weight of the airplane. Most airplanes have a maximum takeoff weight that is higher than maximum landing weight. Should a problem develop soon after takeoff, the weight may be above the maximum landing weight, and dumping fuel allows the weight to be reduced quickly. Question: What is the highest altitude an airplane can fly? Answer: The highest commercial airliner altitude was 60,000 feet by Concorde. The highest military air-breathing engine airplane was the SR-71 — about 90,000 feet. The highest airliner flying today reaches 45,000 feet. The highest business jet flying today reaches 51,000 feet. Question: When a baby is born in flight, what determines the nationality of the child? Answer: The nationality of the child is dependent on which airline the birth occurs, where it occurs and the nationality of the parents. Different countries treat births differently. In some cases, rules stipulate that where the baby is born, the nationality is offered or required. Other countries have the nationality of the parents as their rule. In some cases, the nationality of the airline can become the nationality of the baby. Based on this patchwork of rules, there are scenarios in which multiple citizenships may be available for the child from which the parents can choose. Question: How does the evacuation test work? Answer: Manufacturers and airlines frequently demonstrate evacuations to regulators. This is done when a new airplane is certified or when an airline purchases a new airplane. The participants are not specially trained and represent a wide age range. They are aware that they are participating in an evacuation drill, but not given any more information. Half of the exits are blocked. The participants are not aware of which exits are blocked until the evacuation is started. Every occupant must be safely off the airplane within 90 seconds. Question: How do pilots remember and then repeat all of the instructions from ATC? Answer: Listening and understanding radio calls from ATC is a learned skill. Pilots fly for many years, working with ATC. The more experienced crews fly into more complex airports. Part of the training process for first officers before upgrading to captain is experiencing many different ATC environments. Question: What happens when lightning strikes a plane? Answer: Lightning strikes will usually leave small burn marks or holes at the entry and exit point. Airplanes are designed to allow lightning to move along the skin of the airplane without doing damage. Occasionally, a static wick will be the victim of lightning exiting the airplane. Question: I believe aircraft have de-icing mechanisms. What is the difference between these and, say, a windshield defroster, and why couldn't they be used in place of having wings sprayed with de-icing solution? Answer: Inflight de-icing equipment de-ices only the leading edges of the wings, propellers and sometimes the tail. Other parts of the airplane, such as the windshield and pitot tubes, are heated to prevent ice buildup. On the ground, ice forms on the entire surface of the airplane, resulting in significant weight and the distortion of the airflow, which is potentially dangerous. Consequently, ice must be completely removed from the airplane before takeoff. Heated fluid knocks the ice off the airplane, then a thick gel is applied, so any ice or snow that falls will not stick to the airplane and will blow off during the takeoff roll. This gel is effective for only a limited time, requiring pilots to refer to tables to determine how long the period between de-icing and takeoff can be. Trying to heat the entire airplane would require a very large amount of hot air and a very heavy mechanism; therefore, it is not efficient. Question: The airlines are adding more seats to their planes. Are they jeopardizing passenger safety? Answer: No, each airplane is certified for a maximum number of passengers based on the ability to evacuate all passengers and crew within 90 seconds. Most airlines do not have the maximum number of seats installed, so an increase in the seats that is still below the maximum certified number does not jeopardize safety. Question: What is yaw, and how does it affect an airplane? Answer: Yaw is movement of the nose of the aircraft perpendicular to the wings (left or right). It can cause the heading to change and can create asymmetrical lift on the wings, causing one wing to rise and the other to lower (roll). Jets with swept wings have a natural tendency to yaw, requiring an automatic small input to the rudder to counter it. The device that inputs this small rudder is known as the yaw damper. Question: I've flown on the Airbus 380 several times. It seems to me the taxi speed is slower than smaller equipment. Is this an illusion of size — larger objects appear to be moving slower — and the higher position of seats in the upper deck? Or are there reasons, such as fuel-use and braking concerns, that make it taxi more slowly? Answer: The A380 is a very large airplane, which has a wingspan of more than 260 feet. The long wingspan means the jet can taxi only on certain designated taxiways and will have the wingtip pass closer to objects and other airplanes. Consequently, A380 captains do tend to taxi more slowly. The weight of the airplane causes increased stopping distances. You are correct that being in the upper deck and the sheer size of the airplane make it appear to move more slowly, but large airplanes do tend to taxi a bit slower. Question: Recently, it has been rumored that some airlines are considering using the Airbus A321-LR for trans-Atlantic flights. Do you think narrow-body aircraft will be the future for international travel? Answer: It is possible that several airlines could begin flying A321LRs on trans-Atlantic routes. The airplane has the range to make the flight. The Boeing 757 has been used on less-traveled trans-Atlantic routes for many years. Both are single-aisle airplanes, also known as narrow-body aircraft. As the service to secondary cities continues to increase, the ability to fly non-stop instead of connecting in a hub to a wide-body aircraft will be very appealing. The planes will not replace the wide-body aircraft flown between the large cities. There is growing discussion about low-cost trans-Atlantic airline service. In the past, it was not successful; however, there are several budget international airlines entering the market or interested in doing so. Question: Is over-reliance on automation increasing the number of commercial airline accidents? Answer: No, the number of accidents is decreasing. Over-reliance on automation has become a factor in a larger percentage of accidents, but the overall number is trending downward. The appropriate use of automation and maintaining manual flying skills are focus items for aviation. Training has to include extensive use of automation and manual flying. Question: Can a larger aircraft land on a shorter than recommended runway in an emergency? Answer: Yes, it can be done. Every airplane has a required runway length due to the physics of decelerating. It is much shorter than many people realize. When landing on very short runways, the pilots will very carefully control the speed, touch down on the touchdown point and use all of the deceleration devices (brakes, spoilers and reverse thrust). Question: Where does my bag go when I check it? Answer: From the time a bag is checked in, a series of belts and carts transport it to the waiting airplane. If your airplane is a larger one, the bag will be loaded into a container to make it faster to load onto the airplane. Security screening of the bag occurs before loading to ensure the safety of the flight. When the loading begins, it is sent up via belt loader or in the container into the cargo hold where it is kept warm (sort of) and pressurized during the fight. At your destination, the reverse occurs. The belt loader or container loader takes the bag to a cart where it is sent to the terminal to meet you. Question: When the announcement is made that, "The pilot has begun his initial approach," why is the word initial used? It implies there may be more than one approach. Answer: It is a differentiation of the segments of the approach. There is an initial part of the approach and a final phase of the approach. The final phase is often the last 5 miles when the airplane is aligned with the runway and is descending toward it. Question: Why do airlines on domestic flights carry life vests, with all the extra weight that entails? Answer: Airplanes often fly domestic and overwater flights in the same day. It is not uncommon for an airplane to fly several domestic flights, then fly to Bermuda or the Caribbean. Returning from the overwater flights, it then flies other domestic legs. One of the NTSB recommendations from the accident in the Hudson was to have all airliners have life vests available for passengers due to the large number of lakes and other bodies of water over which airplanes fly. Question: Right after takeoff, it often seems that the pilot slows down and the plane drops somewhat. Why is that? Answer: The sensation of slowing down is really one of slowing the rate of acceleration; this is due to reducing the thrust after takeoff to the climb setting. The sensation of “dropping” comes from the retraction of the flaps and slats. The rate of climb is reduced, causing it to feel like a descent. Question: Can you explain all the different lights on a commercial aircraft and their purpose? Answer: Lights vary on airplanes, but all have red and green lights on the wing tip, and a white light visible from behind (it can be on the tail or aft part of the wing tip). Additionally there are landing lights to provide illumination of the runway during landing. A taxi light provides a lower-power light to see taxiways; the taxi light can be supplemented by special lights to help make sharp turns. There are often lights that illuminate the wings so the pilots can inspect for ice build-up. The red flashing lights on the top and bottom are known as anti-collision lights. Many airplanes have bright flashing white lights called strobes making them easier to see. Question: How bad does turbulence have to be before we should be freaking out?? Answer: Unexpected turbulence is uncomfortable, but is not a safety risk to the airplane. Airplanes are designed for it. The last case of a turbulence-caused accident was in the 1960s in Japan. There are some similarities with a boat hitting a wave in water. One difference is that the airplane may experience more vertical displacement, making it feel more severe. Most humans do not like the sensation of negative Gs, which you feel when the airplane drops suddenly. That sensation is caused by the vestibular system in your ears. In everyday life we do not experience negative Gs often, making the sensation unusual and scary to some people. This is a normal reaction. Pilots have experienced this sensation many times and have no problem flying the airplane safely. Question: How were airport codes assigned? Answer: There are two different types of airport codes: the International Civil Aviation Organization (ICAO) and the International Air Transport Association (IATA). ICAO uses a four-letter code, in which the first letter is the country code. The USA uses K for its code. The New York airports are KJFK for Kennedy, KLGA for LaGuardia and KEWR for Newark. These codes are used for the filing of flight plans and for air traffic control purposes. The IATA codes are used for ticketing and are three letters. Chicago O'Hare is ORD, London Heathrow is LHR, and London Gatwick is LGW. The IATA codes are used for baggage, too. Question: Why is there no window next to my seat? Answer: When jets are certified, one consideration is the consequence of a catastrophic engine failure, where rotating engine components are not contained within the cowling. In the very rare event of uncontained parts puncturing through the cowling, it is possible that they could strike a window causing damage and decompression. This area is strengthened, and the area where the window would normally be is solid. Question: Do airplanes have a hard time taking off in hot weather? Answer: I would not say they have a hard time, but performance is definitely limited by the heat. Hot air does not allow the wing to create as much lift (fewer air molecules); therefore, the weight must be reduced to maintain the required climb path. Very high temperatures such as Arizona, the Middle East or other desert environments require careful preflight planning. Question: Is it safer to be on a smaller plane or larger one? Answer: It is not possible to make a safety differentiation between small or large airplanes because the terms are vague. Regional airline-size airplanes have a somewhat higher accident rate than do larger airline jets. Turboprops have a higher accident rate than jets. Airline jets have some models having lower accident rates than others, but size is not the determining factor. Aviation is the safest form of transportation. This makes it very hard to say that one airplane is significantly safer than another. They are both safe — even if one type has a slightly higher accident rate, that rate is still infinitesimal. Question: Why does it take so long to open the exit door? Answer: Once the airplane arrives at the gate and is properly chocked, the captain shuts down the engines and switches off the “Fasten Seat Belt” light. The anti-collision light (this is the red blinking light on the top and bottom of the airplane) is switched off, informing ground crew that it is safe to approach the airplane. Ground crew members then begin to position the jet bridge, aligning it with the door. Once the jet bridge is mated to the aircraft and the cover is in place, the ground agent either opens the door or taps on it for the flight attendant to open it. Once the door is initially opened, the ground agent assists in fully opening it and ensuring that it is locked in the open position. This is the generic procedure for most jet airliners. Regional or smaller airplanes have a slightly different procedure as their stairs are built into the door. Question: How do runways get their names? Answer: The runway number is the approximate magnetic heading. As an example, runway 35 is pointing approximately 350 degrees magnetic. The opposite end of the runway is 17 or approximately 170 degrees magnetic. When there are two parallel runways pointing in the same direction, they are designated with the proper number and a left or right identifier. Two runways pointed east are named 09 Left and 09 Right. The 09 indicate they are pointed 090, due east, and the left and right identify the parallels. When there are three runways, they use the same process but include a “Center” designation. If there are four runways or more, the airport will change one of the runway numbers to help differentiate them. As an example, the north runways pointed to the southwest at LAX are named 24 Left and Right, while the south runways are named 25 Left and Right. The runways point in the same direction but the difference allows pilots to know which runway to use. Question: What efforts are being employed to ensure computer hacking doesn't negatively influence modern aviation from the ground or while in flight? Answer: Computer security is taken very seriously. Airplane flight control and flight management computers are segregated and hardened against outside intrusions. It is possible a hacker might interfere with an in-flight entertainment system, but those and the onboard wireless system have separate pathways from the flight computers. Improving security is an ongoing effort by manufacturers, operators and the regulators. Question: Why is shipping lithium-ion batteries considered dangerous, yet almost all passengers have cellphones with them? What's the difference? Answer: A lithium battery installed in a device is less likely to enter thermal runaway and, if it does, there are few batteries nearby to be driven into thermal runaway. Shipping lithium batteries on passenger aircraft poses a risk that is higher than many operators find acceptable because of the rapid expansion of a fire when lithium batteries enter thermal runaway. Question: Are there routes over the continental U.S. that tend to experience more turbulence than others? Answer: In some conditions when there are high surface winds, crossing the Rocky Mountains can be turbulent. The mountain waves this condition creates are more pronounced around larger mountains, making the airways crossing them more turbulent. Question: Does it matter how old a plane is? Answer: If an older airplane is properly maintained, it is safe. The age is not a factor; it is the quality of maintenance that matters. Question: Why don’t airplanes have external cameras for the pilots to use when taxiing or parking to better guide the plane? Answer: Some of the larger airplanes (e.g. Airbus A340 and A380, and the Boeing 747-8) have cameras to help assist the pilots on taxiways and at gates. Smaller airplanes (e.g. B737 and A320) do not need them as the flight crew can see the wingtips. The widebody airplanes that do not have cameras installed by the manufacturer require careful positioning by the captain during taxiing and parking. It has not been cost-effective to retrofit these airplanes with cameras. Question: When an aircraft is descending toward landing, it seems some planes fly down nose pointed downward, and some seem to float down with the nose pointed up. Is this true, and if so, why the difference? Answer: When configured for landing, the position of the nose is determined by whether there are leading edge slats installed. Airplanes with leading edge slats (movable panels on the front of the wing) approach the runway with the nose up, while airplanes without slats approach with the nose down. Question: Have you ever gotten lost at an airport, considering the congested nature of some U.S. airports? Answer: Taxiing, particularly at a large airport in limited visibility at night, can be very challenging. Many of the modern airliners have electronic maps with the position of the airplane displayed, which really helps. Those that do not have electronic displays require the crew to have taxi charts out and to agree on the taxi clearance and actual route. I have never been lost but have taxied slowly and been very careful to follow the taxi clearance, using input from the first officer. Question: How do commercial airliners and military aircraft share the skies? Answer: Air traffic control does a great job of keeping airplanes separated, be they commercial, private or military. In addition, the military branches have special airspace they can use for training and maneuvers. Question: How could a plane land at the wrong airport? Answer: There are several contributing reasons: Humans often see what they expect to see, even when it is wrong. This is known as confirmation bias and contributes to the pilot believing it is the correct airport and runway when it is not. Two pilots and rigorous crosschecking with navigation displays normally break the confirmation bias early. Fatigue can also be a factor, as performance degradation can make it more difficult to recognize the mistake. Modern airplanes have many wonderful navigation tools helping to avoid such events. Question: How do flight planners determine which aircraft to use on what route? Answer: Airlines have route-planning specialists to ensure that the right-size airplane is used for the route, that any maintenance considerations are taken into account, and that airplanes arrive at the proper location for inspections and service at the proper intervals. It is an art to keep the schedule running. The scheduling professionals learn the job after years of airline experience and are vital to smooth operations. Question: In freezing conditions, with ice on the runway, how safe is the anti-skid braking system on a modern jet? Answer: The modern jet’s anti-skid system is very good. I have landed on ice-covered runways many times using the anti-skid system to safely stop the airplane. Pilots listen carefully to other landing airplanes for descriptions of the stopping ability on the runway. Runway conditions can change quickly, requiring judgment and experience by the pilot to determine whether it is safe to proceed. This system has worked very well for many decades to ensure the safety of landing aircraft. Question: I'm amazed at how the pilots steer their plane so effectively while taxiing and then stay centered on the runway's center line. How are these procedures done? Answer: Pilots keep the airplane centered on the runway using a combination of nose-wheel steering and rudder. From very basic flight training, it is a skill that is taught and evaluated frequently. It is critical to keep the airplane aligned with the center line. Some airplanes are easier than others, but a pilot is expected to master it before being released to fly. Pilots watch for drift during takeoff roll and apply rudder with the rudder pedals. On some airplanes at lower speeds it may be necessary to add a bit of nose-wheel steering to achieve the desired track. A plane landing at São Paulo/Guarulhos–Governador André Franco Montoro International Airport in Brazil. Question: Do airline pilots need a college degree? Answer: Pilots have varied backgrounds; most are college graduates, and many have master's degrees or PhDs. It is more important to be able to learn the material, understand it and properly apply it than to have a specific level of education. Question: What do the in-flight chimes mean? Answer: Different airlines use the chimes differently. Here are some uses I've witnessed in my career: A single chime could be to the flight attendants to advise them of pending choppy air, perhaps serious enough that they should be seated. Another possibility would be, "when you have time, could we please have a coffee?" Two chimes are often used to indicate the aircraft is approaching 10,000 feet in altitude. Three or more chimes could be to tell the flight attendants to be seated NOW due to reports of turbulence that were just received by the pilots. Cabin crew can also use the chimes to communicate with the flight deck. A single chime could be, "would you like coffee?" Three or more chimes to the flight deck could be, "we have a passenger with a medical problem that could require a diversion." Question: I read that the FAA requires that pilots and co-pilots eat different meals on a flight. Was that ever really an FAA (or CAB) rule or is it company policy/practice at each airline? Answer: I have not seen an FAA requirement for a meal difference. 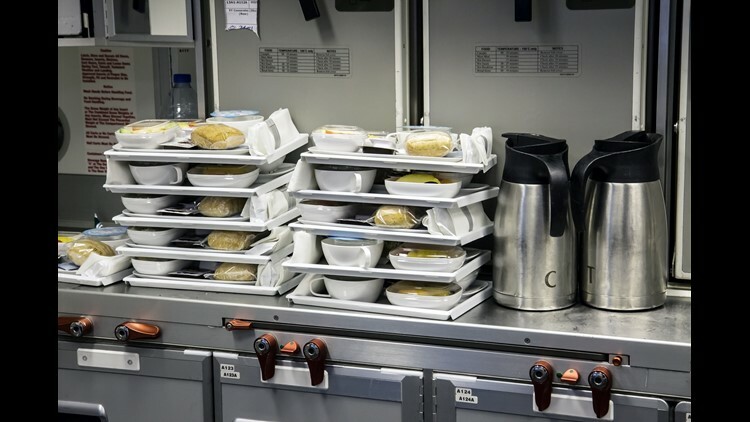 Many airlines require different meals for members of the flight crew in the belief that it mitigates risk of food-borne illness, but it is a choice made by each operator. Q: Do you get the same crummy food the passengers do or do you get a special meal? A: Flight crews do not get special meals. Crew meals for international flights are provided from the same flight kitchen as the passenger meals. Q: Why do pilots allow a flight to depart the gate without enough food/drinks for all the passengers on board? A: Pilots want all the passenger items to be on board prior to departure. There are occasions when it is not possible due to availability from catering or limited food options at an airport. This is not the pilot’s fault, and they calculate that many passengers would rather depart with low catering supplies than take a major delay. Q: Since most airlines only allow a small personal carry-on and a small bag to be carried on, why do airlines allow employees to carry three and sometimes four items on? A: Flight crew members are not restricted to the two-bag limit. They are often flying multiple-day trips and cannot check their bags. In addition, it is common for crew members to bring food to ensure they get adequate sustenance. Q: Why don't you ever serve hot dogs on planes? A: Food onboard is the choice of the airline. Why they serve what they serve is different for every operator. Newburgh, N.Y., to Bergen , Norway (Norwegian Air): Norwegian Air has added nearly two dozen U.S.-Europe routes during the past two years, but few connect smaller airports than this one. This seasonal route – flown on Boeing 737 aircraft – links the southwest Norway city of Bergan to the small-but-ambitious Stewart airport, located about 70 miles north of New York City in Newburgh. Fort Myers, Fla., to Dusseldorf, Germany (Air Berlin): While demand to South Florida is high from just about everywhere, there’s still something a tad unexpected about this route that links two secondary airports. The route won’t last much longer, however. Insolvent Air Berlin is expected to drop the route in October. Fort Myers, Fla., to Cologne, Germany (Eurowings): Fort Myers won’t be without a route to western Germany for long. Eurowings, a low-cost subsidiary of Lufthansa, is set to launch flights to Cologne/Bonn in May 2018 as it looks to backfill some of the routes being dropped by bankrupt Air Berlin. Philadelphia to Budapest: Sure, Budapest has become one of Europe’s top urban destinations. But this route stands out because American is the only U.S. airline to fly to the Hungarian capital. And its flights aren’t from New York, Chicago, Atlanta or one of the other U.S. hubs most commonly associated with flights to secondary international destinations. That’s a testament to how important American’s Philadelphia hub – inherited in its merger with US Airways – has become to the carrier. An American Airlines Boeing 777-200 takes off from Los Angeles International Airport in January of 2015. Indianapolis to Paris Charles de Gaulle: Delta announced this route in September. Indianapolis had been working for years to land service to Europe, and now this flight on Delta becomes its first ever regular route to a city outside North America. Hartford to Edinburgh, Scotland: Another route on Norwegian Air makes the list. As of June, fliers can now fly non-stop on the carrier’s new Boeing 737 service between the capital of Connecticut and the capital of Scotland. St. Louis to Reykjavik, Iceland: From the “Show Me State” to the land of glaciers and volcanoes, fliers will have the option to fly non stop from St. Louis to Reykjavik starting in May. That’s when Icelandic budget airline WOW begins flying the route. It’s one of several contenders for this list by WOW, known for offering sale fares to Europe for $99 one way or less. Other recent WOW routes include Cincinnati-Reykjavik and Detroit-Reykjavik. Cleveland to Reykjavik: Speaking of Iceland, Cleveland had gone nearly a decade without non-stop service to Europe. But that changed in a span of about 24 hours this summer, when Icelandair and rival WOW announced plans to expand to Cleveland on back-to-back days. Philadelphia to Glasgow, Scotland: Another route by a major airline to a secondary European city that’s offered by American from Philadelphia. The Glasgow route is another reminder of how important the Philadelphia hub has become for American’s trans-Atlantic ambitions. Boston to Birmingham, England: Boston has long been a major international gateway for U.S travelers/ The English city of Birmingham, however, has been mostly a niche destination for trans-Atlantic flights. Upstart discounter Primera will test how much demand there is for flights between these cities starting in June. That’s when it begins four weekly flights on Airbus A321neo single-aisle jets that will be packed with 198 seats. The route is one of six marking Primera’s first flights to the U.S.
Newark Liberty to Porto, Portugal: It’s hard to consider any international flight from New York City’s three airports as obscure. But for United, which operates a hub at Newark, the just-announced non-stop to this secondary Portuguese destination might be as close as it gets. And United is not alone. TAP Air Portugal also flies the route. New York JFK to Malaga, Spain: The same hold true here: If there’s trans-Atlantic flight from the U.S. to a secondary city in Europe, there’s a decent chance it will come from New York. Still, that a non-stop flight exists to the Spanish city of Malaga might come as a surprise to some. Newark Liberty to London Heathrow: What’s weird about this route? Nothing, at least on the surface. Flights connecting metro New York and London are the most-common offering across the Atlantic. But one of the airlines flying this route is Air India, exercising a “fifth freedom” aviation right that allows it to sell tickets between the cities. After a stop in London, the flight continues on to India. Houston Bush Intercontinental to Manchester: Houston is one of the USA’s busiest airports, so it has a healthy roster of international flights. Still, the non-stop route to Manchester is one of the more unusual trans-Atlantic options – especially so because it’s flown by Singapore Airlines. The “fifth freedom” route continues on to Singapore after the stop in England. New York JFK to Rig (and Tashkent): If there were such a thing as an obscure flight from New York, a non-stop option to the Latvian capital of Riga, Latvia, might fit the bill. That it’s operated by Uzbekistan Airways adds the allure. Uzbekistan Airways also flies non-stop from JFK to Uzbekistan’s capital of Tashkent. That destination in central Asia is another that likely flies beneath the radar for most Americans. Fairbanks to Frankfurt: German leisure carrier Condor Airlines added this seasonal route to its summer schedule in 2017. Will it return for 2018? That was unclear, as Condor had not yet added it to its booking schedule for next summer.